Reinecker Vision of Germany offers a wide range of CCTV's designed to meet different needs and budgets. The Mezzo line of desktop CCTV's offer a wide variety of monitor sizes, camera types, XY tables, and portability options. 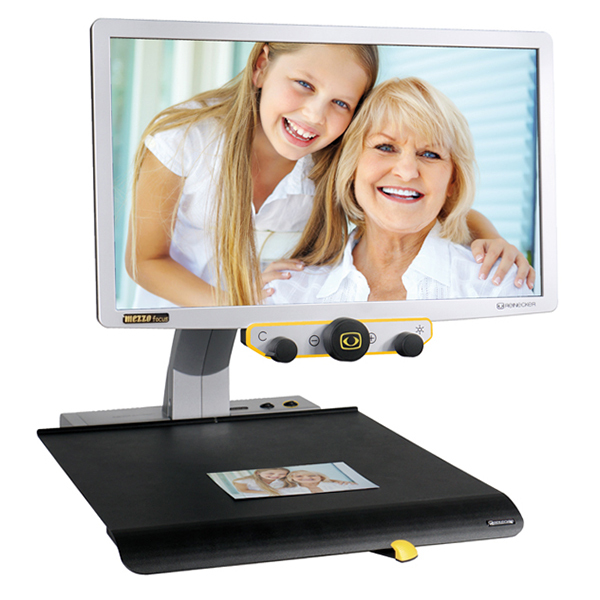 All units feature a distinctive folding HD LED monitor which folds flat for transport and offers spring form balancing for ergonomic positioning. The Focus camera uses Low Vision High Definition (LVHD) technology to offer a Full HD high resolution image with no blurring or shadowing. With its smaller size and sleek footprint, the Focus 22" is a great unit for people wanting a full size desktop CCTV at a competitive price. At 16.5 pounds, it can be easily moved from room to room. Magnification can range from 1.6X to 32X, depending on selected settings. Other features include customizable color selections, windowing, line marking, simple 3 button operation. Battery operated unit separately available.